St. Vincent’s University Hospital is part of the St. Vincent’s Healthcare Group which also includes St. Vincent’s Private Hospital, Elm Park and St. Michael’s Hospital, Dun Laoghaire. St. Vincent’s Healthcare Group offers a unique multi-disciplinary approach to patient care in the country’s only integrated multi-hospital campus. The Group provides front-line, acute, chronic and emergency care across over 50 different medical and surgical specialities. The two public hospitals are an integral part of services in the region, providing local, regional and national services in designated specialties. At St. Vincent’s Healthcare Group we will strive to maintain excellence in clinical, multi-disciplinary care, education and research – and we will continue to develop our hospitals in line with these principles, and with our responsibilities to the wider Irish healthcare system. We will treat each of our patients individually with dignity and respect recognising, at all times, the right of everyone to access the care and treatment they need to achieve the best possible healthcare outcomes – regardless of race, ethnicity, religion or gender. We will remain true to our values of human dignity, compassion, justice, quality and advocacy. 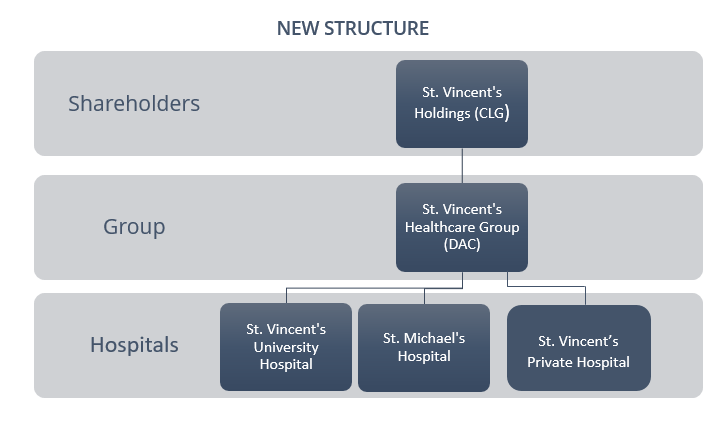 St. Vincent’s Healthcare Group is governed by a Board of Directors which is appointed by the shareholders. The Board consists of between two and fourteen members. The current Board membership is ten members, following the resignation of two representatives of the Religious Sisters of Charity (RSC) in 2017. • Audit Committee: responsible for reviewing all non-clinical audit-related issues. • Nominations and Remuneration Committee: responsible for reviewing the effective operation of the Board, and succession plans for the Board, its committees, and senior management, and the remuneration of senior management. • Public Hospitals Oversight Committee: responsible for all matters relating to the clinical, operational and financial affairs of SVUH and SMH. • Private Hospital Oversight Committee: responsible for all matters relating to the clinical, operational and financial affairs of SVPH. • Risk Advisory Committee: responsible for providing assurance that there are appropriate and effective systems in place to cover and manage all aspects of risk, quality and safety in the Group and its hospitals. St. Vincent’s Healthcare Group (DAC) is an Irish company governed by Irish company law. Established in 2002, it is a private company, limited by shares which provides medical, surgical, nursing services, accommodation, education and research at St. Vincent’s University Hospital, St. Michael’s Hospital and St. Vincent’s Private Hospital. The three hospitals are branches of the main company which has charitable status. St. Vincent’s University Hospital was founded in 1834 by the Religious Sisters of Charity (RSC) who in 2017 announced the decision to transfer their shares to a newly formed company with charitable status called ‘St. Vincent’s Holdings (CLG)’. The new constitution of St. Vincent’s Holdings (CLG) and revised constitution of St. Vincent’s Healthcare Group (DAC) have been submitted to the Charities Regulator. The constitutions will reflect compliance with national and international best practice guidelines on medical ethics and the laws of the Republic of Ireland. The new company will not be subject to any religious influence, and will not have any Board members drawn from religious bodies. The clinical independence of the new National Maternity Hospital will be enshrined in the Memorandum and Articles of the new hospital, as agreed by both St. Vincent’s Healthcare Group and National Maternity Hospital in the agreement mediated by Kieran Mulvey. The state’s interests in the new hospital are guaranteed under the terms of the Mulvey agreement.